Over the last few days, we have focused on the geology and volcanic history of Tvashtar Paterae, a string of four volcanoes located within Io's high northern latitudes. During the Galileo mission, Tvashtar was the site of several volcanic eruptions between November 1999 and October 2001, including a large, sulfur-rich plume that was seen by Cassini during its brief flyby in late December 2000. Since the end of the Galileo mission in 2003, monitoring of active volcanism on Io was limited to intermittent data taken at ground-based telescopes like the European Southern Observatory in Chile, Keck II, and IRTF in Hawaii. In addition, in late February 2007, the Pluto-bound New Horizons spacecraft flew by Io from a distance of 2.26 million kilometers (1.4 million miles), allowing the cameras on-board to search for surface changes on the moon since it was last seen five years earlier. Today, we will discuss the volcanic activity seen at Tvashtar since the end of the Galileo mission as what this volcanic history tells us about the variety of eruption styles exhibited by the volcanoes of Tvashtar and how their lavas are fed. Don't forget to check out the previous two parts of our series on Tvashtar Paterae, if you haven't already done so! Part One - Part Two. This article is also part of our broader series where we examine one Ionian volcano each week. 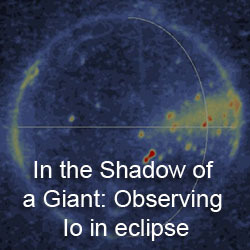 Throughout the 2000s, Io was imaged on numerous occasions using the adaptive optics system at the European Southern Observatory and Keck II telescopes. These two large telescopes use adaptive optics to partially correct for atmospheric effects on data acquired at these telescopes. Much of the data acquired of the Tvashtar region since of the end of the Galileo mission has been taken at the Keck II, 10-meter telescope at Mauna Kea in Hawaii. Other facilities have been used, of course, to monitor Io's active volcanism, but they often use techniques that only work for Io's Jupiter-facing hemisphere, on the other side of the moon from Tvashtar. After correcting for atmospheric effects, researchers using Keck II to observe Io can achieve a spatial resolution of 120 kilometers at near-infrared wavelengths. Unfortunately, because time on this one telescope is very limited, only a few nights each year were available to observe Io, and when you combine the possibility of inclement weather at Mauna Kea and the fact that Tvashtar wasn't always on the visible hemisphere, you can tell that there weren't many opportunities to observe Tvashtar. As far as I can tell from what has been published and what is online, between the [effective] end of the Galileo mission and the New Horizons flyby, the Keck group, which includes Franck Marchis, Imke de Pater, and Conor Laver, observed Tvashtar on: 12/22/2001, 12/26/2001, 03/08/2003, 05/29/2004, 04/17/2006, and 06/02/2006. Between at least December 2001 and May 2004, Tvashtar was not seen in Keck data. This suggests that it had become quiescent enough to not have any lava hot enough to produce detectable thermal emission. However, the data from 2006 showed that Tvashtar had cut short its vacation and became more active. Intense thermal hotspots were observed at Tvashtar during observing runs on April 17 and June 2, 2006. The emitted power seen on June 2, the higher resolution of the two runs, was 7.7 ± 0.9 × 1012 W, more than twice that seen at Pillan during its eruption in 1997, but still an order of magnitude less power than released at the most powerful volcanic eruption ever seen by humans, the Surt eruption in February 2001. Laver, de Pater, and Marchis published their data a year later, finding a blackbody temperature of 1240 K for June 2 data. This measurement was aided by the use of the then-new OSIRIS camera at Keck, which acquires high-spectral resolution data for each pixel, much like NIMS on Galileo, VIMS on Cassini, and CRISM on the Mars Reconnaissance Orbiter. Comparison between images like those at left with a Galileo/Voyager basemap revealed that the hotspot was centered at 59 ± 1 N, 121.5 ± 1W, placing Tvashtar C within the error box [see the map I posted yesterday for the letters used for the different volcanoes at Tvashtar]. The area covered by this basaltic lava was estimated at 57 km2 (14,100 acres), consistent with the size of Tvashtar C. However, given the size of the hotspot and the resolution of the available data, it is not impossible that it was located a bit farther to the north, at Tvashtar B (the site of the November 1999 and December 2000 outbursts). A few months before Tvashtar re-awakened, the New Horizons spacecraft was launched from Cape Canaveral, bound for the then-most distant planet in the Solar System, Pluto. To get all the way out to that distant world in a timeframe that wasn't ridiculously long, the spacecraft was launched on the fastest trajectory of any interplanetary spacecraft, and even then it required a gravity assist at Jupiter to fine-tune its path and to boost its velocity to get out to Pluto in 2015. This gravity assist at Jupiter took place on February 28, 2007, providing an opportunity to test the spacecraft's instruments on the many worlds of the Jupiter system. 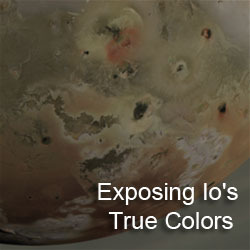 More than 190 images were acquired during this encounter of Io by LORRI, a high-spatial resolution camera system with a single, broadband band pass. Additional data was taken by MVIC, a lower-spatial resolution, 5-filter camera that covers visible and near-infrared wavelengths, and LEISA, a near-infrared mapping spectrometer. 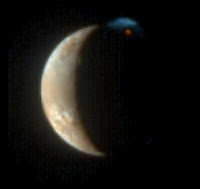 A couple of weeks before New Horizons made it closest approach to Jupiter and Io, John Spencer and Kandis Lea Jessup observed Io using WFPC2 on the Hubble Space Telescope. Images taken on February 14 and a week later on February 21 revealed a large plume over Tvashtar Paterae, not unlike the one seen by Cassini in December 2000. While the plume was only seen in ultraviolet filter images, it was hoped that the plume would still be visible at high angles in New Horizons images. When New Horizons started imaging on February 24, 2007, it turned out to be even better than that. A large volcanic plume, 350 kilometers (220 miles) in height, was visible in early, low-phase angle images of Io. 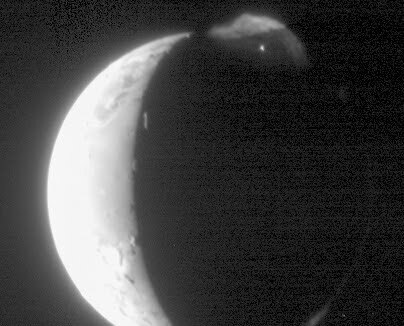 The near-polar position of Tvashtar also meant that the plume was visible in nearly every image taken by New Horizons. This data also revealed a new red ring deposit surrounding Tvashtar Paterae as a result of this plume. In one case, repeated imaging over the course of eight minutes allowed John Spencer and his group to track clumps within the plume as they descended from the crest of the plume to the surface. Their motions are consistent with sulfur and sulfur dioxide gas condensing at a shock front at the top of the plume (rather than dust particles rising with expanding gases, like at Prometheus), then descending as it flows down along the shock flow front. 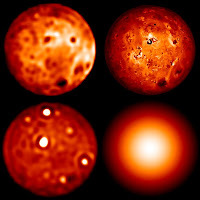 The clumps likely form from electrostatic forces either generated by the interaction of plume particles (doubtful considering the spacing between individual grains) or from electrons brought in by Jupiter's magnetic field or the flux tube that connects Jupiter and Io. The fact that the plume was so easily visible in LORRI and MVIC images suggests that plume contained more dust than other giant plumes like Pele's or the Tvashtar plume seen in 2000. A thermal hot spot was also seen at Tvashtar by all three cameras on New Horizons (neglecting ALICE since it barely resolved Io). The high-resolution data acquired by LORRI (~10-20 kilometers per pixel) allows the eruption site to be determined, corresponding with the southern half of Tvashtar B. This was also the site of the December 2000 outburst that also produced a large volcanic plume and high thermal emission. Using the LEISA spectrometer, temperatures around 1250 K were found, though the detection of a hotspot in daylight images with the visible light LORRI would suggest that higher temperature components are likely as part of an active lava fountain or curtain. 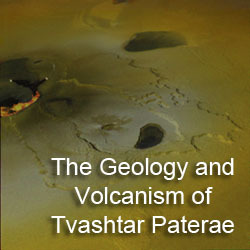 The volcanic eruptions seen at Tvashtar since 1999 suggests that certain volcanoes experience specific eruption styles. For example, Tvashtar B was the site of three, maybe four, large outburst eruptions over a period of a little over seven years. Each of these eruptions involved lava fountains that generated intense thermal emission, even at visible wavelengths. The 2006 eruption by itself generated about 7% of the total power output of all of Io's volcanoes put together. That eruption may have occurred at the small Tvashtar C patera instead, but no prior eruption had been seen there except for some faint thermal emission seen by NIMS in August 2001. Based on observations of the 1999 eruption, these eruptions don't last very long, less than three months, or transition from one type of eruption to another, as the lava fountaining phase transitions to open lava channels flowing out across the surface, and later to one dominated by insulated flows where lava is transported through lava tubes, limiting the visibility of hot lava to remote sensing. Dark diffuse deposits surrounding Tvashtar B show these lava fountains also generated pyroclastic flows consisting of basaltic tephra. This eruption style is reminiscent of large, explosive volcanic eruptions on Earth, like Laki in 1783. At Tvashtar A, a large, dark whale-shaped volcanic region dominates. It is uncertain based on the current data if this region is a large lava lake that is only intermittently active or is an insulated lava flow that is again, only occasionally active. Only one unambiguous eruption was been detected at Tvashtar A in February 2000, with a pair of hot vents and a broad area of hot lava. Same story for Tvashtar D, though there is no evidence it has been active in the recent past. A region of dark basaltic lava had brightened between February 2000 and October 2001 showing that it was cool enough to allow sulfur and sulfur dioxide from the eruption at Tvashtar B to condense on it. The awakening of Tvashtar since 1999 is likely the result of magma from a deep source at a depth of 30 kilometers (19 miles) that has become active again. Its depth, in addition to help feed massive lava curtains, can also allow it to feed magma to multiple volcanoes. That's why you can see one eruption at Tvashtar B and a few months later an eruption can get started up at Tvashtar A. A similar situation was seen after the Thor eruption in August 2001. Small volcanoes nearby, which had also never been seen as active before 2001, came out of dormancy at about the same time. Kami-Nari experienced a phreato-magmatic eruption two years after the nearby Pillan eruption. Io's heavily fractured lithosphere can facilitate the movement of magma from these deep reservoirs to either shallow magma reservoirs (likely the case for Tvashtar A and D) or directly to the surface as dikes during intense, outburst eruptions (the case for Tvashtar B, maybe C too). The latter case can also transition to the former, as the dikes also feed sills below the volcano. These sills can later grow into shallow magma reservoirs. These provide a more consistent source of lava that can support persistent eruptions like Prometheus or Amirani. Tvashtar is one of the most well imaged volcanoes on Io with three sequences at spatial scales between 183 and 315 meters (600-1,033 feet) per pixel. This imaging permitted Galileo researchers to study an outburst eruption up-close and changes in the distribution of pyroclastic deposits and lava flows as a result of these intense eruptions. The geology of this region is also intriguing, with a large plateau surrounding much of Tvashtar Paterae. This plateau is marked by evidence of sapping that has eroded the plateau back, in some cases forming canyons 40 kilometers (25 miles) long. Next week's volcano of the week is Shamshu Patera, a volcano with not nearly as intense eruptions of Tvashtar. Over the next month, we will also look at Isum, Maasaw, and Loki. While Maasaw has been fairly quiet, both Isum and Loki have had very unique eruption styles that will be interesting to examine. Leone, G.; L. Wilson. (2001). "Density structure of Io and the migration of magma through its lithosphere". Journal of Geophysical Research 106 (E12): 32,983–32,995. Spencer, J.; et al. (2007). 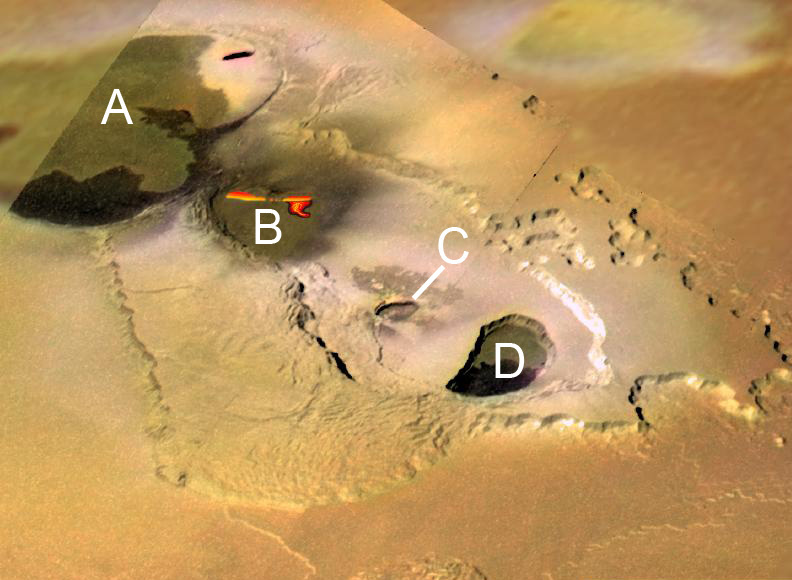 "Io Volcanism Seen by New Horizons: A Major Eruption of the Tvashtar Volcano". Science 318 (5848): 240–243. Laver, C.; et al. (2007). "Tvashtar awakening detected in April 2006 with OSIRIS at the W.M. Keck Observatory". Icarus 191: 749–754.